Students in Cookbooks and History (MET ML 630), directed by Dr. Karen Metheny, researched and recreated a historical recipe to bring in to class. They were instructed to note the challenges they faced, as well as define why they selected their recipe and why it appealed to them. Here is the third essay in this series, written by Laura Kitchings. 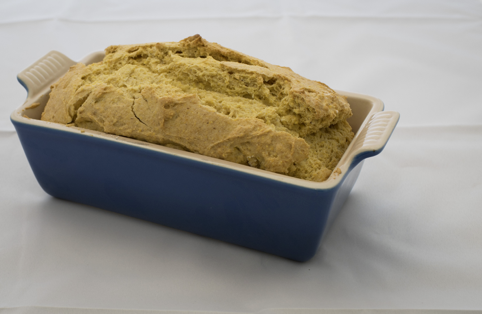 I chose to work with the corn meal bread recipe from Mary Randolph’s The Virginia Housewife (Randolph 1838, 141) because it was gluten-free, which suits my dietary needs, and easily transportable, so I could bring the finished project to our class. I had been working with the cookbook for another assignment, and was curious as to the usability of her recipes. 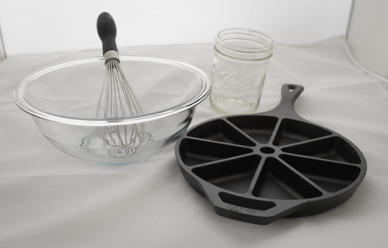 I started by considering the material culture I thought I would need: a whisk, a bowl for mixing, a pint measurement, and a divided cast iron pan. I believed that the divided cast iron pan would replicate the technology available in 1838, and substitute for the little pans from the recipe. In choosing the ingredients, I tried to find materials as close as possible to what would have been available at the time in Virginia, while completing a weeknight shop at a suburban Massachusetts grocery store. I chose whole milk, unsalted butter, organic eggs, and for the cornmeal, I chose a brand that did not list any additives. For my first attempt, I decided to light one burner on a gas grill and then put the cornmeal mix on the furthest part of the grill from the lit burner. I then left it for approximately forty minutes. Unfortunately, I had forgotten to activate the yeast, and when I checked on the mixture it had not risen and had started to bake. It had also developed a gas taste, which may be attributed to the newness of the particular gas grill. For the next attempt, I remembered to activate the yeast and decided to use the oven. 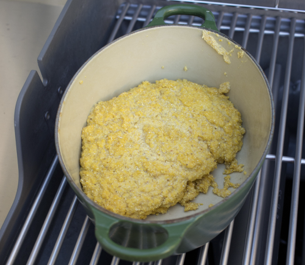 I set the oven for 205 degrees Fahrenheit and put the cornmeal mixture in an enabled cast iron pot, similar to the technology of the time. Again, when I checked on the mixture after about forty minutes in the oven, it had started to bake. I tried to save the mixture by putting it into the divided cast iron pan, adding butter to hydrate the mixture. Putting the cast iron pan in a 400 degrees Fahrenheit oven and checking it after ten minutes, it had become a crumbly mess. I then decided to make cornbread as I usually do. I used a mix with added sugar and baking soda, which served as a leavening agent. I used almond milk for the milk and olive oil for the oil. Following the instructions on the package, the end result looked fluffier and tasted sweeter than the mixture from Randolph’s recipe. This was mainly a result of the added sugar and leavening agents, not from changes in the cornmeal itself. 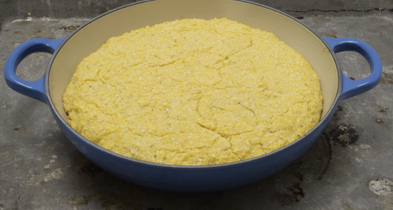 I also realized that while creating cornbread using the mix superficially appeared to use only a few ingredient, both the almond milk and the cornbread mix contain a multitude of ingredients, far more than Randolph’s recipe. For my final attempt at Randolph’s recipe, I realized that my kitchen is a more controlled environment than the kitchen envisioned in the recipe. The thermostat in my kitchen read 70 degrees Fahrenheit, which I assumed to be accurate. 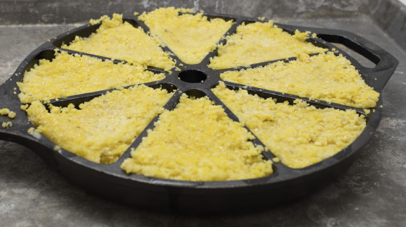 Randolph could not assume a kitchen with a controlled environment, so she had the user put the cornbread mixture near the fire, as this would allow the yeast to work with the cornbread regardless of the temperature of the kitchen. I ended up putting the mixture in a shallow enameled cast iron pan and left it on my counter for twenty minutes. The mixture did rise a small amount. I then placed the pan into a pre-heated 375 degree Fahrenheit oven, the same temperature I had baked the cornbread from the mix. I kept the mixture in the shallow pan, as I decided that this would mimic the surface area of the little pans required in the recipe. The result was a solid, dense cornbread. While waiting for the various rounds of cornbread to bake, I had been reading Diane Tye’s Baking as Biography. In this book she discusses the fall of the price of white sugar in the mid-nineteenth century and the corresponding rise in its consumption (Tye 2010). Randolph’s recipe was likely published before the change in sugar prices and to early 19th-century palates the cornbread was likely considered somewhat sweet. In comparison, my 21st-century palate found the bread to lack sufficient sweetness, while the cornbread from the mix tasted only somewhat sweet. While I do not plan to re-create other recipes from Randolph’s book, the experience did make me examine other historical recipes with more care, and consider the motives behind the provided instructions. Randolph, Mary. 1838. The Virginia House-Wife. Baltimore: Plaskitt & Cugle. PDF e-book. Tye, Diane. 2010. Baking as Biography: A Life Story in Recipes. Montreal (Québec): McGill-Queen’s University Press.